Unknown Dresden Hallmark? - Antique China and Fine China Collectibles Query:- I have an antique figurine of a young man with roses in his hand. On the bottom of the figurine is crossed swords with the capital letter M on the one "handle" and B on the other "handle". It has been said to be or German origin by Sotheby's 10 years ago, but no one seems to know who the manufacturer is. It is an exquisite piece and I would like to know who the manufacturer/artist was. Many thanks for your "Unknown Dresden hallmark? - Antique China and Fine China Collectibles" query and a warm welcome to you in South Africa. Just a quick piece of useless but interesting information, South Africa is our 16th most popular country of 74 different countries whose visitors regularly visit our site. Anyway, back to the question! Although I am by no means an expert (just an enthusiast who works in the industry), if I have the knowledge to answer queries myself, I am always happy to do so. with the identification of the figurine specifically. This is a page I've written especially to help my visitors research their wares. 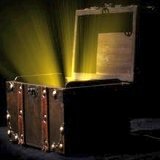 It's a unique identification & valuation resource which puts you in touch with a professional appraiser (personally checked out by me) who will tell you if the mark is identifiable by experts without you having to pay any money upfront. My service is unique online and is designed to protect my site visitors from wasting their time and money online. While I can't identify your piece, there are some clues, even with the absence of a photo (note to visitors: wherever possible, please try to upload a picture with your submission). I have looked at all the pottery marks of the best known of the German makers using crossed swords and I can see none using the letters M and B. This means that the piece is of a lesser known maker or smaller factory - not one of the big names. So your piece may have a rarity value to a collector for that reason alone. Louise, I would love to find out more about this figurine of yours. Please leave a comment here once you know. Angels by the Same Unknown German Dresden M & B Maker - Unknown Dresden hallmark? - Antique China and Fine China Collectibles Query: I have 8 white angels (orchestral), 5 1/4 inches high, with the same crossed swords, M on the left hilt, B on the right hilt. Underneath the swords is "Germany" and under that is "Dresden". I've been searching all night on Dresden and Meissen sites without success at finding this hallmark. Glad to have found this and your suggestion/link, Peter. I was intrigued by your follow up question to this mysterious Dresden maker. I did some more digging, only to find, by pure fluke, due to one ebay auction I found, that the maker is, in fact Martha Budich who started her business in 1951 and retired in 1977. 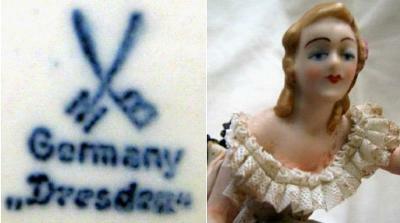 In 1963 she had to change her crossed swords pottery mark due to legal rows with Meissen. So my theory proved right, that it was a small lesser known maker. The encyclopedias never overlook a big name. Hope that saved you some money! Thanks for the info. I have come to the conclusion that the figurines could be by Martha Budich, but thought they were older as my mother inherited it from my grandmother. The flesh pieces are all unglazed - a fact that I overlooked earlier. There is also a STAMP in the bottom of the one figure which reads either 1526 or 7526. I would love to know what the value is. I'm really pleased to know the maker as I've been trying to find the origin of the mark on a pair of figurines I have for years. However, they can't have been made between 1951 & 1977 as mine have been in the family for several generations. Do you mean 1851 to 1877? You said "However, they can't have been made between 1951 & 1977 as mine have been in the family for several generations. Do you mean 1851 to 1877?" As they say time and again on the Antiques Roadshow (on the bits that never get aired, but we Elves search the cutting-room floor for) - sorry to burst your family heirloom bubble, but Martha Budich items are not antique - she began in post World War 2 Dresden. Whose been telling little porky pies to whom? p.s. "porky pies" is a well known Elf euphemism for being economical with the truth, based on the slang talk of our English cockney Elf cousins. I just recently found a set of 4 ivory porcelain figurines, all musicians, about 5 inches tall. The mark is similar to the one shown here, but I can't tell what the letters on the swords are.I would like to add a picture, how do I do that? 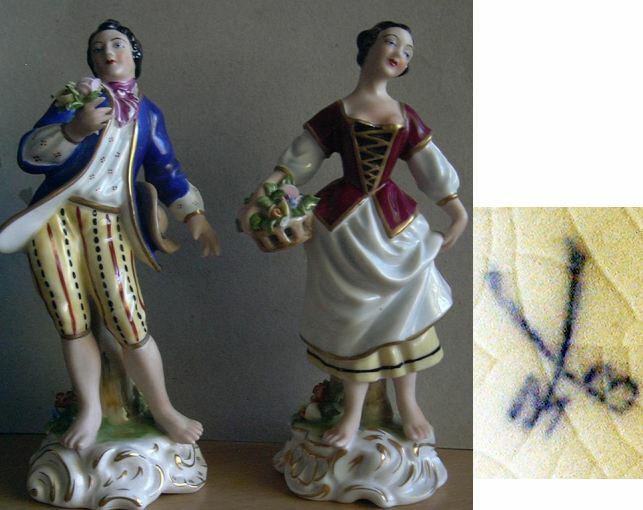 I have two small and very detailed figurines with a similar mark; cannot quite read the letters and need to have daylight to get good photo. Lacework on these figurines is incredibly fine; hard to believe it is a lesser artist. However, it certainly doesn't seem to be a Meissen mark. Germany is written below as part of the mark, but not Dresden. Both figurines are in dark brick red jackets with white lace cuffs showing; green short pants with gold edging and white stockings. I've been trying to identify what these are and where they came from for years. They were left in a cottage we bought in Ontario in the late 50s, from the estate of a Vice President of either Canadian National or Canadian Pacific Railway, cannot remember which! Would be interested in swapping photos. If you would like to contact me, email me using these words but not the brackets before the "at" sign (lesleydiane) and outlook.com after it. Trying to avoid scam bots! Thanks; hope to hear from you. the marque seems to be crossed swords with boxy sword handles and at the top, they join into a 'M'. It is blue and I can send photos of it. Thanks for the info - much appreciated. I have inherited a lot of Royal Doulton figurines and haven't got place to put them, they have been evaluated by Sotheby's twice(which I have) for my mother-in-law. Anyone interested to buy them all, can have them for a much reduced price. I've got pictures and the HN numbers. They are all in excellent condition. Unfortunately I have 2 sons who are not interested in antiques and only believe in Japanese minimalism! The figurine I have and its marque don't seem to match the latest ones about which you speak. I have attached photos and would appreciate your feedback. If theJPEG doesn't come through then tell me an email address to which I can send it so that you can have a look and maybe identify it. ...I guess the best way to share images here would be to each put ours in the Cloud. I'd love to be able to let people see the two I have.cannot take the time to try that right now; busy day. But might be able to later. Am going to try to post images of the two item I have. Thanks to Lesley who wrote in for an appraisal from one of the experts on my valuation team on two figurines with this RP crossed swords mark, we have the definitive answer. Sad to say our resident Help Elf's comments above weren't quite right, but they were nearly right, as you will see when you read below about the very close connections between three successive Bavarian firms from the town of Kronach. The RP on the sword hilt mark base mark stands for R. Pech of Kronach, Bavaria. R. Pech purchased the porcelain factory of Gebrüder Kühnlenz (founded in 1884) in 1929 after unpaid debts by bankrupted American companies in the Great Depression had closed the company down. Pech simply carried on where Kühnlenz had stopped, making different types of decorative porcelain like mantelpiece sets etc. 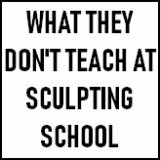 It wasn't until 1937 that figurines were made, and at that time they were only a small part of the offering. The war years made it difficult to survive and after an attempt to get going again with new figurine products after the war, the attempt finally failed in 1951. At this point a new company was created in the same town using the same style of crossed swords with initial style logo, making the same type of small Dresden lace figurines. This company was called Martha Budich who later ran into problems with Meissen for using the crossed swords device and were made to change it. Budich was a decorator who also made her own series of Dresden lace figures. Presumably the similarity between the Pech figures and the Budich figures were due to the fact that the same staff and techniques were employed at both Kronach plants. Perhaps, and this is pure speculation, Budich was a former employee of the Pech plant before its closure. The Budich plant was itself closed in 1977. I also have a set of 8 porcelain angels with this marking. Thanks for clearing up the mystery markings. These angels were purchased by my parents in Frankfurt between 1956 and 1959, so the timing fits for when she was making these items. I have a candle stick, decorated with roses, with the same mark. Germany Dresden, and above this, the crossed swords with M and B. 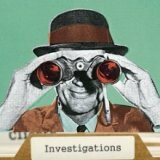 Wonderful to find this link. Post war is likely for mine, as it was Mum's and she was married in 1957. I am reading that the crossed swords with MB are attributed to Martha Budich of Bavaria. I have a pair of candlesticks which I bought at a small household auction in the 1960's. each candlestick has two arms which are joined by two 'bridges' with a short tree like pillar in the centre. On the front and back of each there is a china pink rose and smaller roses on the arms. On the base there are two blue crossed swords with the initials M and B on the hilts. The wording underneath also in blue is: Germany and beneath Dresdea. notice 'last letter 'a' not 'n'. all the contours of the candlesticks are outlined in gold. I would love to be able to find out their worth.